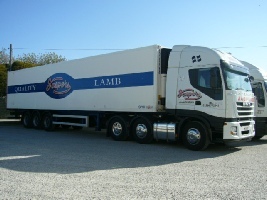 To ensure that we provide the highest level of quality from start to finish we deliver our products in our own maintained fleet of modern refrigerated vehicles. Our despatch teams scan all of our customers' orders through a computer system to guarantee the order is correct before the products are loaded onto our fleet. So we can provide a superior level of personal service when the order is delivered, we do not use third party haulage firms. We employ and train our own drivers to the highest standard. - We calibrate our refrigeration units yearly to guarantee that they are chilling to the correct temperatures. - Chiller units have the facility to print out temperature readouts for up to 7days. - The trailers are fully sanitized upon arrival back to the Plant after deliveries.